Goa Tourism Development Corporation (GTDC) Chairman Dayanand Sopte on Tuesday directed the contractor to immediately kick-start work on tourism amenities, including toilets and changing rooms, at the world-famous Colva beach. The GTDC Chairman also assured the people that clean-up work on the contaminated Colva creek will also commence at the earliest, with tourism officials saying work is underway to prepare the estimates for the purpose. He also promised that GTDC will take up the parking project at the Colva beach which will take care of the increasing traffic load at the beach. 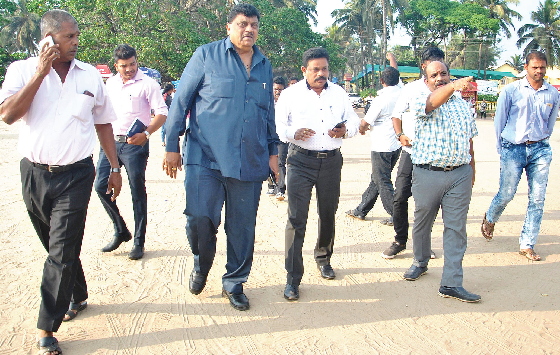 Making his presence felt at the iconic beach on Tuesday at the invitation of NCP Benaulim MLA Churchill Alemao, Sopte took stock of the situation at Colva, particularly on the amenities for the visiting tourists and directed the contractor to commence work on the toilets and changing rooms from Wednesday. In fact, the GTDC Chairman issued clear directions to the contractor to complete the work within a month’s time when the contractor has promised to put the amenities in place within three months. “Why do you want three months to complete the toilets and changing rooms coming up on land admeasuring 250 square meters?” Sopte questioned the contractor and directed him to start the work from Wednesday. The Benaulim MLA also questioned the contractor for seeking three months to complete the work, and asserted the toilets should be ready immediately before the end of the tourism season. Churchill also sought Sopte’s intervention to clean up the Colva creek and explore the possibility of using the two-km long water body for water sports. “The creek should be cleaned up at the earliest. The retaining wall should be strengthened and the water body should be used for water sports, which would provide employment to the local youth,” Churchill said. Churchill told the GTDC chairman that the Corporation should go ahead and clear the encroachments which come in the way of setting up the tourism amenities at the beach. While Sopte welcomed Churchill’s stand, the GTDC Chairman sought cooperation from the local people as well as the local panchayat body in clearing up the encroachments. Sopte also expressed his unhappiness over the state of affairs at the Colva beach, while promising a turn-around in the near future. Given that work on the tourism amenities requires NOC from the CRZ, Churchill asserted that Colva too should get the CRZ clearances if beaches in North Goa such as Candolim and Calangute have received the same. MARGAO: GTDC Chairman Dayanand Sopte has favoured a probe into the decision to lease out the Corporation’s properties to private players. “Definitely, there should be an inquiry into the issue,” he said, when the media drew his attention to his demand made while in the opposition for a probe into the Corporation’s decision to lease out the GTDC properties. “I have just completed one month in office. I have to study more things about GTDC. Definitely, I will inquire into the decision to lease out the Corporation’s properties. It is my duty to inquire because government is a continuous process. People may come and go, but we have to take decision taking into account the betterment of Goan people,” he said. MARGAO: Saying that he has kickstarted his meetings in Mandrem, Congressman-turned-BJP leader Dayanand Sopte on Tuesday said that he now enjoys good relations with former Chief Minister Laxmikant Parsekar as they both belonged to one political party. He also said that it is the duty of the BJP leadership to ensure that differences amongst party leaders and workers should be resolved amicably not only in Mandrem, but in other constituencies as well.